“OK, tall people to the back row. Hey, you, in the second row, yeah you, would you move your head a bit to the side?” Well, what can you say to 20 Picasso portraits for the price of one? Fine, you don’t believe me–go count them yourself! This charming collection of visages offers a reprise of Picasso’s neoclassical portraiture, with a couple of caricatures thrown into the crowd. The portraits are as different from one another as can be, but they are united by a common focus to the side. The mood of the crowd is generally serene, with gentle smiles playing on their lips. Only the two caricatures have their doubts. As one inevitably scans the work from face to face to face, one gradually takes on the crowd’s peaceful mood. By contrast, the lone eyes below gaze straight at us with an uncompromising stare. They underscore Picasso’s pictorial emphasis on eyes, the facial feature upon which he lavished the most attention and in the portrayal of which he was the most inventive. This work really needs to be seen in person to be fully appreciated, not the least of which reasons is its large scale. At 75 cm, I believe it is the third largest Picasso lithograph. 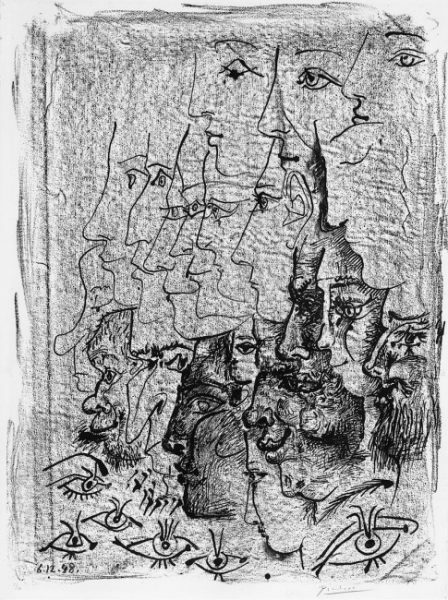 Mourlot recorded that this lithograph was created as a “series of pen and brush drawings [and] crayon rubbings to try a paper sized according to the artist’s instructions.” Presumably, Picasso realized that this larger scale would be better suited to such an elaborate study of physiognomy.